The CPI(M) is currently being rocked by an internal ‘debate’ over what has emerged, to put it in somewhat old-style communist speak, the ‘Congress Question’. I put the word ‘debate’ in quotation marks because, there is a touch of innocence to the way positions in support of a possible alliance with the Congress are being expounded by respected, senior intellectuals like Irfan and Sayera Habib in their letter to the party politbureau or Badri Raina in his article in a leading newspaper. These statements follow the dramatic exit of another widely respected Central Committee (CC) member, Jagmati Sangwan, from the party for precisely the opposite reason – of the CC going soft on the Bengal CPM for having gone against the commonly arrived at understanding in allying with the Congress. There is undoubtedly a potential debate here but since the common reference point in both – the Habibs’ letter as well as in Raina’s article – happens to be the recent election in West Bengal, one cannot help feeling that it is either a ‘debate’ over a non-problem or is, at best, a question badly posed. Far from transparently and decisively resolving the issues which plague the Party and the Left movement in India, the twenty first Congress of the CPI(M) has yielded a schizophrenic outcome. The purported ‘political line’ adopted by the Party Congress and the ‘unanimous’ choice of the new general secretary are quite contradictory, which will only perpetuate the ideological-political incoherence that has gripped the CPI(M) and may further contribute to its organizational disarray. The CPI(M) is going to have its party congress next year in the backdrop of its worst ever electoral performance in the general elections. A four day meeting of its central committee held recently to discuss the review report and political resolution for the party congress, however, ended without adopting any worthwhile political decision. The only decision was to have another central committee meeting in January next year. When meetings of the topmost committee of a national political party end only with fixing the next meeting, something must be going wrong somewhere. It reflects lack of political direction and disarray at the top. Tobe Jadavpure pathanor ki mane? Eight years on I cannot imagine the luxury of lounging about doing nothing much. One moves on in life after graduating from Jadavpur University. Meanwhile, in home and the world, the complete freedom (some will persist in calling this anarchy) of the JU campus has made it a legend somewhat like Dirty Harry: either worship and put it in on a pedestal, or condemn it thoroughly. The reputation of JU since the infamous 1970s has been as a hub of constantly bubbling anarchism, where Naxalites are hatching their next program of action, where ignorant armies like SFI and other anti-SFI groups clash by night. On 8th June, a young woman, a second year college student, was returning home, Kamduni, a remote village of Barasat in the district of North 24 Parganas. She was waylaid by some criminals, who took her to a godown, where they gang raped and then proceeded to murder her. Six hours after she was seen alighting from a bus, her body was found by her brothers and other villagers. The police were forced into some action, after the family and people of the locality refused to even let them shift her body without action first. They accused a number of people, including some connected to the ruling Trinamul Congress, of being rapists. The young woman was well known, as she used to help many children of the locality in their study. 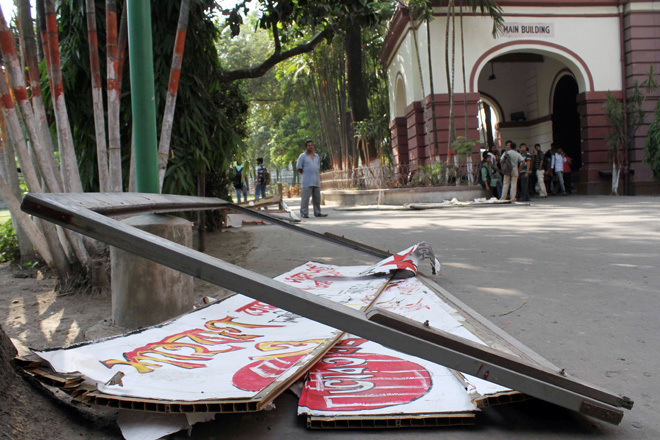 Guest post by WALED AADNAN: On 10th April, 2013, an unprecedented incident happened at Presidency University (erstwhile Presidency College), Kolkata. Now, unprecedented is a strong term when it relates to Presidency College, because it has, over its 196- year- long history, seen much. It has been broken in by rioting mobs in 1926; in the 1960s and 70s, it was the so-called headquarters of the Naxal movement in Bengal; it has nurtured Indian Nobel Prize and Oscar winners and consistently over its history. It has been one of India’s elite colleges and a hotbed of left-wing politics.